Beginning today we will publish a series of articles about the various Day of the Basque Diaspora celebrations that took place around the world and the success they enjoyed. Beginning in the Basque Country we include two articles about events that took place at the Lehendakaritza in Vitoria-Gasteiz and at the Hotel Heredad de Unanue in Donostia. The first edition has set the path for future editions with an eye on the Diaspora deservedly recognizing its reality and its contributions, in Euskadi as well as around the world. Vitoria-Gasteiz. Among the celebrations in the Basque Country, the Lehendakaritza in Vitoria-Gasteiz as the first. The event began at 10:30am and gathered a large representation of the Government and Administration as well as the Basque community. Led by Lehendakari Urkullu, also participating in the event were the president of the Parliament, members of the cabinet and the Deputy Generals from Araba, Bizkaia and Gipuzkoa, the Secretary General of Foreign Action, Marian Elorza, the Director of the Basque Community Abroad, Gorka Alvarez Aranburu as well as representatives from the Diaspora. The latter included Unai Lauzirika, from the Advisory Board, President Laura Iantzi and other members of the Euskal Artzainak Ameriketan Association, members of other clubs and Basque communities and the 15 members of Gaztemundu 2018 that, with Ikurriña in hand, danced and moved more than one during their presentation at the event. Also Martin Goikoetxea, Bertsolari from Wyoming, was there and the teacher and president of the Basque club in Viedma, Argentina Rocio Basterra. Host Julian Iantzi, born in the States where his father went as a herder, introduced the ceremony, that begun with Bertsolaris Xabier Euskitze, and Maddalen Arzallus performing. There was also a video that was created for the day and included a dance performance by the Mulixka Group from Vitoria-Gasteiz. 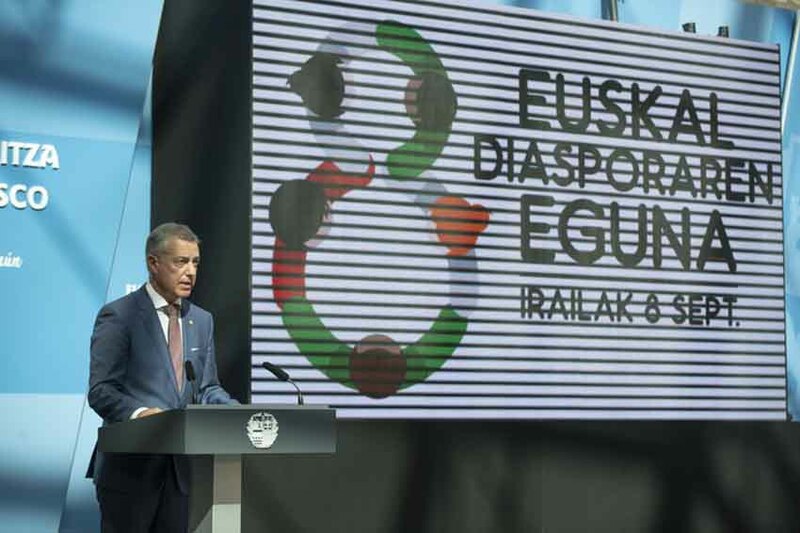 In his address, Lehendakari Urkullu stressed and vindicated the contribution of the Basques in the Diaspora and noted that even if older emigration focused mainly on the American Continent, that today is global and reaches around the world. He said that Basque immigrants are “an important asset for Euskadi-Basque Country” that “enriches us in the present and helps us to create a path towards the future that is more and more open to the world.” “Today we remember our history as a migrant country because others are now knocking at our door in search of a better future. We cannot look away as a society, as a welcoming and hosting Basque society,” he added. He also added that on this first commemoration of the Day of the Basque Diaspora, at least 60 Basque clubs around the world organized events, and he also remembered the Basque community in Venezuela that is experiencing an especially difficult and “worrying” situation.